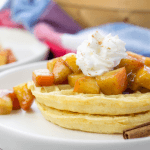 Waffles with Cinnamon Apple Topping are made with fresh Gala apples, cinnamon, nutmeg and maple syrup over Eggo Homestyle Waffles and topped with a dollop of Reddi-Wip Original. We have had a whole lot of snow days this season and the bitter cold has been rough so we have all been a little cooped up inside. Being stuck inside doesn’t have to be a drag though! 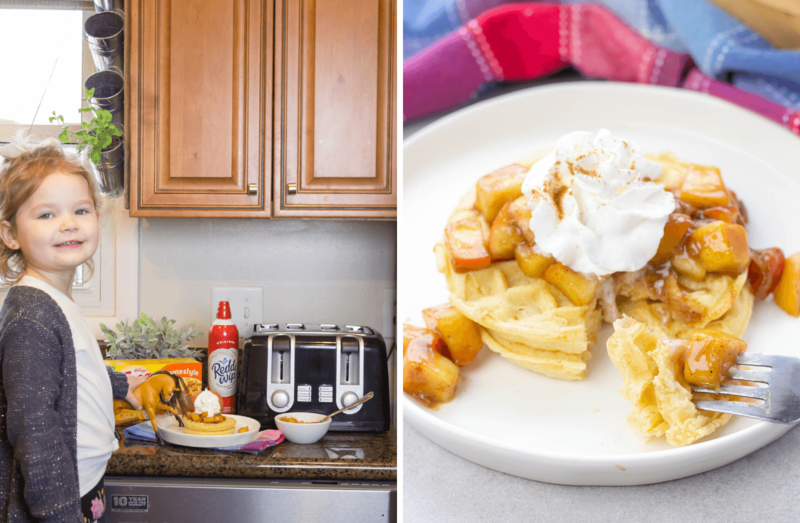 We spent today watching Spirit Riding Free on Netflix while doing some fun activities and creating these Waffles with Cinnamon Apple Topping for a perfect mommy-daughter morning. Our one stop shop before the snow starts falling is Walmart to grab groceries. 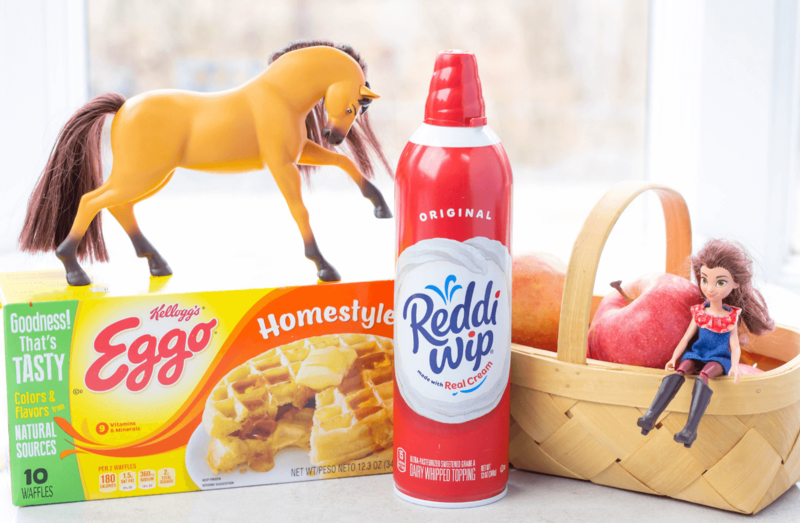 You can find all sorts of great Eggo Waffle varieties in the freezer section and Reddi-Wip in the refrigerator. Walmart also carries a line of Spirit Riding Free toys so my daughter can now bring Spirit everywhere with us! Spirit Riding Free has been one of my daughters favorite shows for the past year. The show is set in Texas with a 12 year old girl named Lucky. Lucky is forced to move away from her friends in the city to a small town where she comes across some unexpected adventures. Her first adventure is with a wild mustang named Spirit with whom she builds an amazing bond with. Spirit Riding Free is a great show for kids to learn about friendship, how to stand up for oneself while doing what’s right, how to appreciate animals and take chances in life with a little adventure. 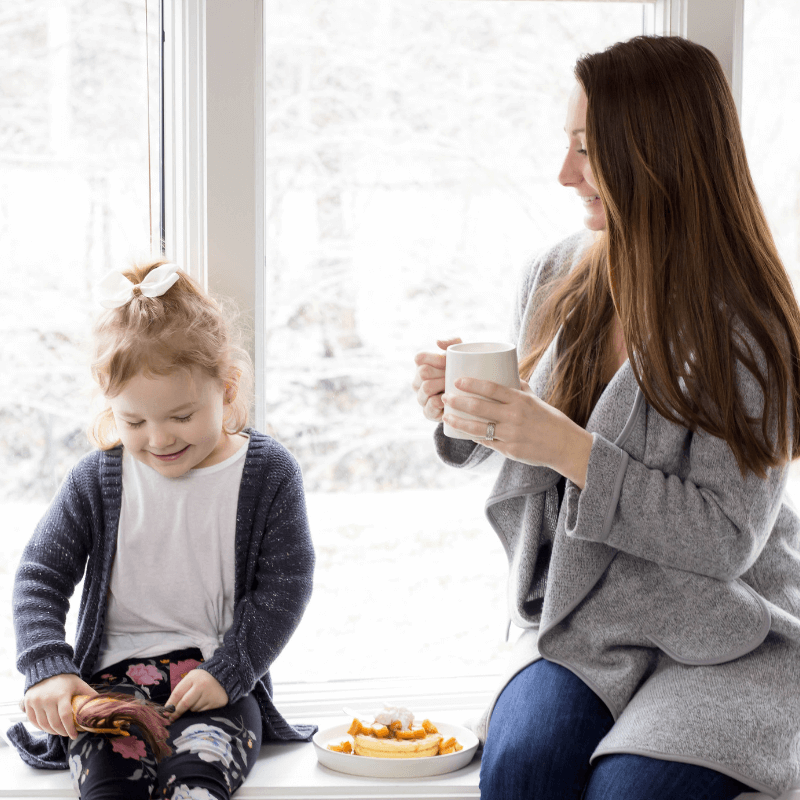 You can print off all sorts of great activities for a snow day, after school fun, spring break or a slumber party featuring Lucky and her friends by clicking HERE. You can always find Eggo Waffles in my freezer. 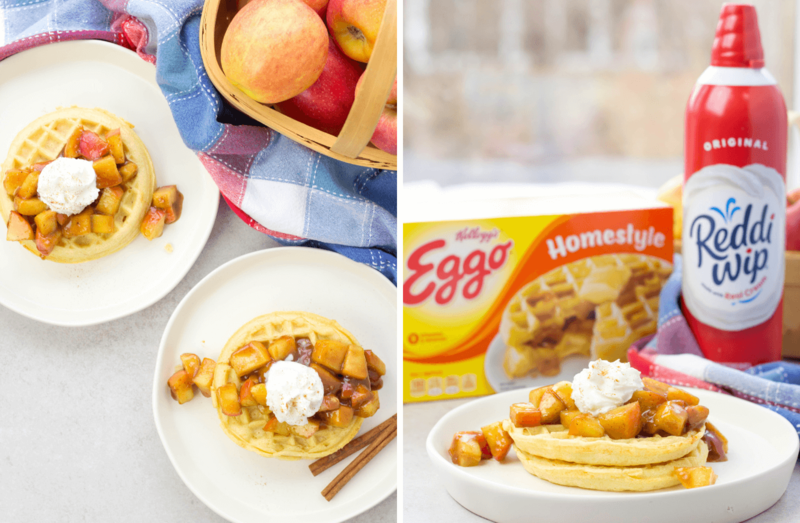 The kids love them, especially the Eggo Homestyle Waffles, and I love them too because you can toast up a delicious, golden crispy waffle in minutes! 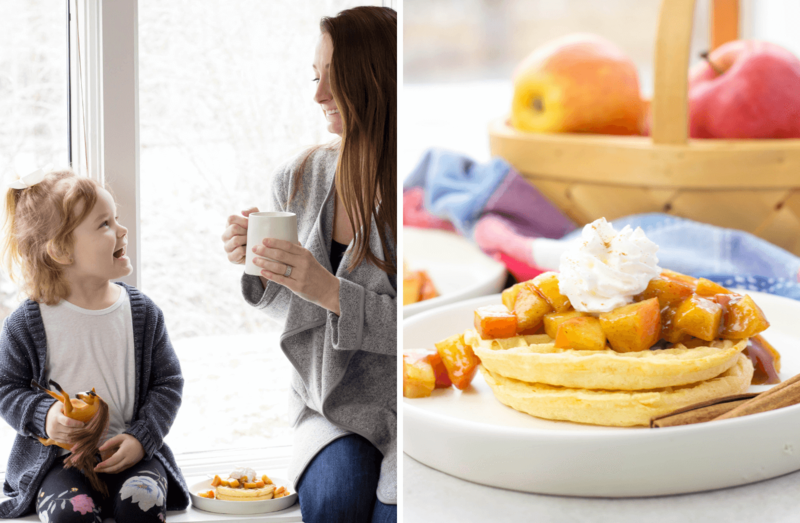 These warm and fluffy waffles are the perfect starting point for our special snow day breakfast. Speaking of special breakfast, the one way to ensure it is memorable is adding a little Reddi-Wip on top. Reddi-Wip uses the best dairy cream in original flavors and has less hydrogenated oils than other frozen whipped toppings. 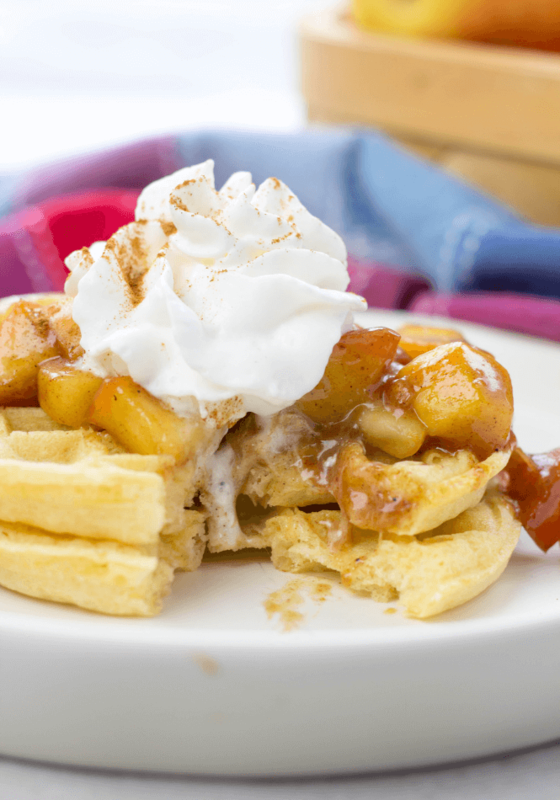 You can taste the real cream and how it adds that little extra something on these Waffles with Cinnamon Apple Topping. Mornings don’t get more delicious than this! 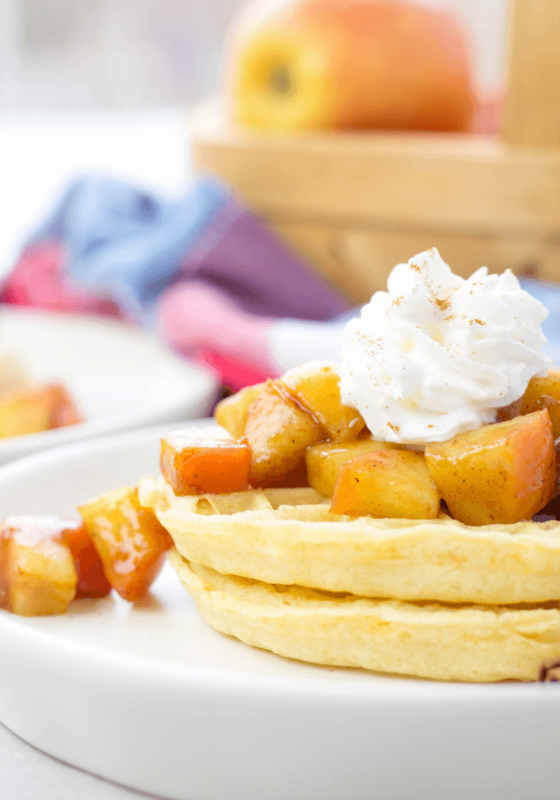 These Waffles with Cinnamon Apple Topping are buttery and crisp with a sweet maple syrup topping with fresh apples. Cinnamon adds in the perfect amount of spicy sweet flavor with an amazing aroma. Make sure to leave to skin on your apples before dicing! The skin of an apple holds the most nutrients with loads of fiber and vitamins like Vitamin C and Vitamin A. Apples help with healthy growth of your child and boosts their immune system. Plus, they taste great! Just get rid of the core and eat the rest. Wash, peel and dice apples. 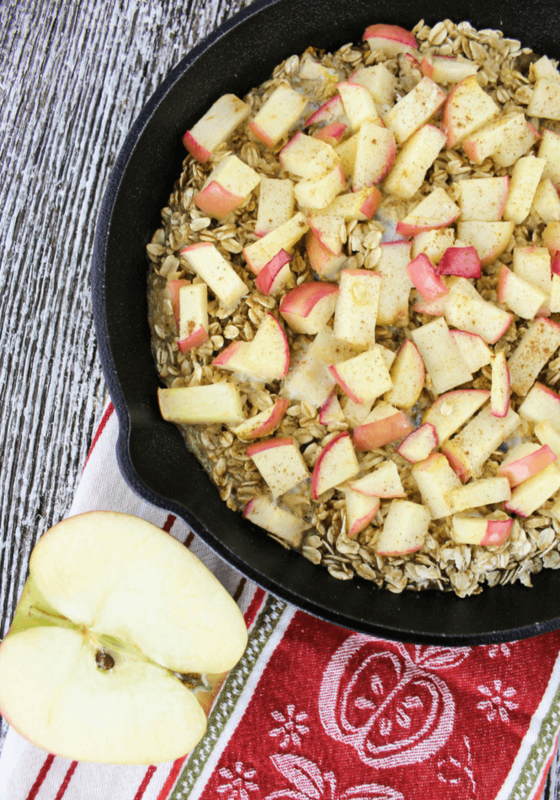 Place the diced apples on the stove top in a sautee pan on a medium heat. Add water, butter, cinnamon and nutmeg. Bring to a low simmer for 3 minutes stirring often. Add maple syrup and stir. Remove from heat. Cook the Eggo Homestyle Waffles in the toaster according to box instructions. 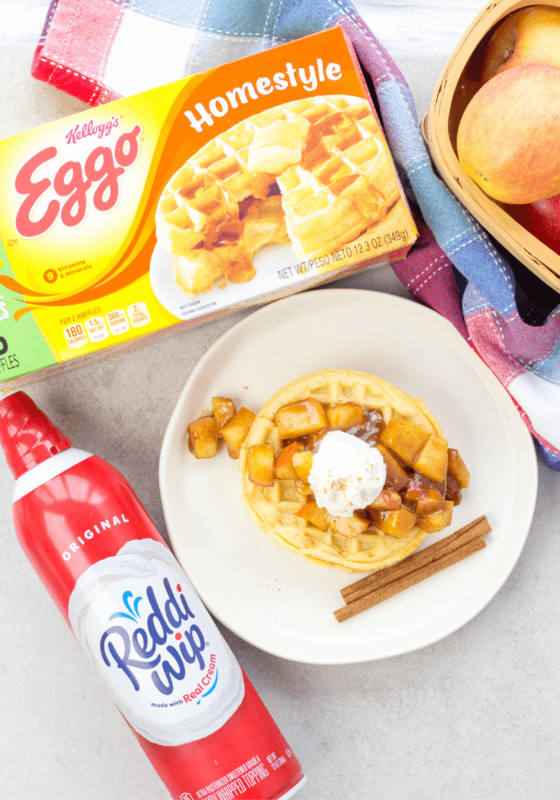 Place the hot Eggo Homestyle Waffles on a plate, top with the warm cinnamon apples and a dollop of Reddi-Wip. Sprinkle with a cinnamon garnish and serve. Do you watch Spirit Riding Free with your kids on Netflix? Why do you love it? Let me know in the comments below and tell me a way which you make breakfast special! 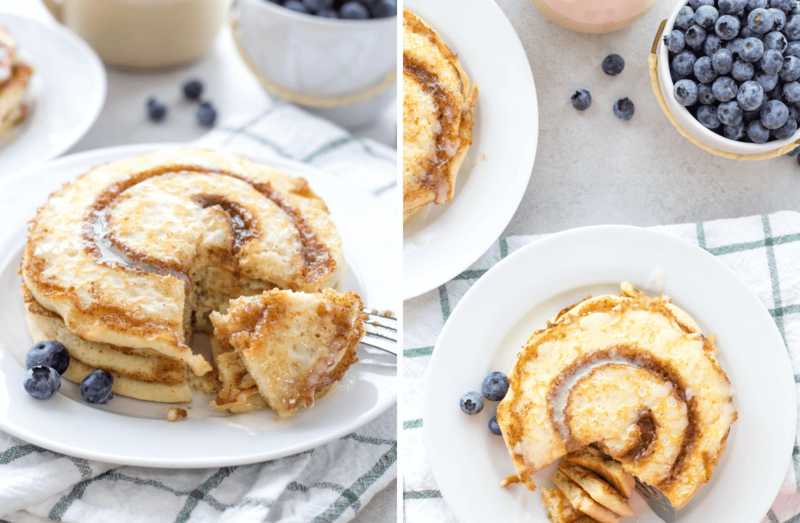 Cinnamon Swirl Pancakes are made with a basic pancake batter with added nutmeg and a pinch of sugar with a delicious swirl of cinnamon and brown sugar and topped with a buttery icing to seriously take pancake mornings to the next level. I think my family is pretty typical with that we love having a big breakfast every Sunday morning. The perfect Sunday morning for me starts with sleeping in longer than normal and taking my time getting out of bed. Then, heading to the kitchen in my pajamas to whip up some breakfast for everyone. 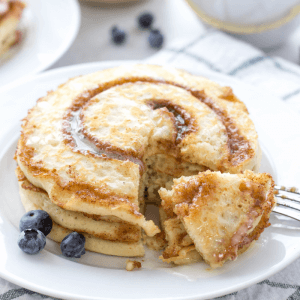 These Cinnamon Swirl Pancakes are a great Sunday morning breakfast that kids and adults both love. They taste like cinnamon rolls but in pancake form with lots of cinnamon and buttery goodness. I think this is where I insert [happy dance]. I put an icing on top instead of butter or syrup but you can certainly pick a maple syrup if you choose. 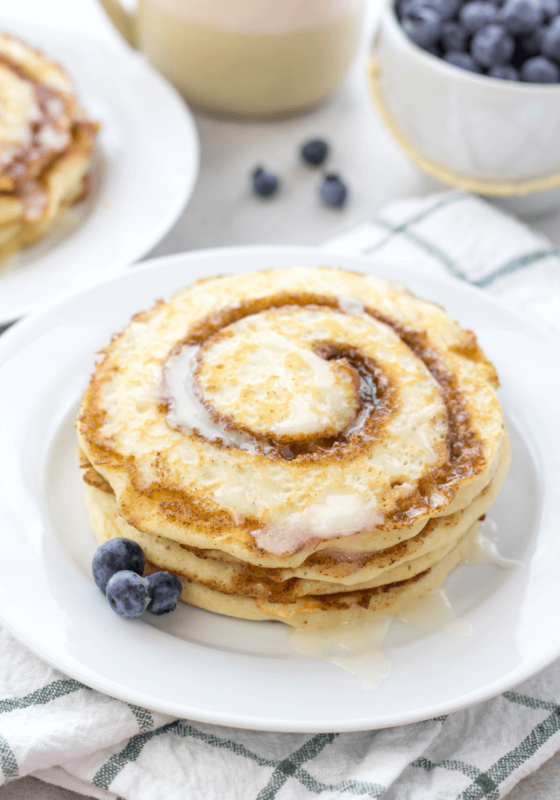 Cinnamon Swirl Pancakes look like they have a lot of ingredients but they are really basic ones and come together easily. The only downer is all the dishes (you need 3 mixing bowls) but trust me when I say that it is totally worth it! The only tip I have for you today is to stay organized. Get out your 3 mixing bowls and make each item individually before beginning to cook. 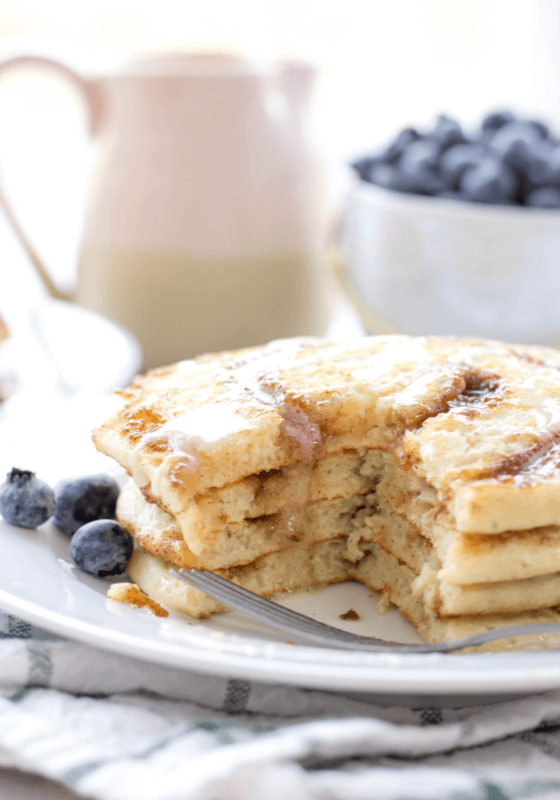 If you do that- this recipe is a breeze and anyone can make these yummy pancakes! 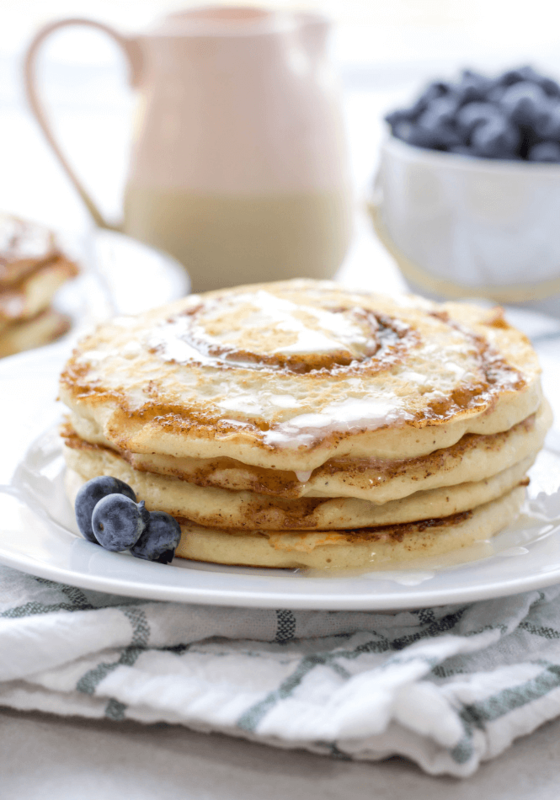 Cinnamon Swirl Pancakes are made with a basic pancake batter with added nutmeg and a pinch of sugar with a delicious swirl of cinnamon and brown sugar and topped with a buttery icing to seriously take pancake mornings to the next level. Recipe adapted from Food Network. In a large mixing bowl, add flour, granulated sugar, baking powder, salt, and nutmeg. Whisk those dry ingredients together. Add vanilla extract, milk, and eggs. Whisk together. Melt 3 Tablespoons butter in a small microwavable safe bowl for about 20 seconds. Pour the melted butter into the pancake batter and whisk again. Set to the side. Whisk together brown sugar and ground cinnamon in a small mixing bowl. Melt 5 Tablespoons butter in a small microwavable safe bowl for about 20 seconds. Pour the melted butter into the cinnamon mix and whisk again. Pour the cinnamon swirl mixture into a sandwich bag and seal. When you are ready to use just cut a small section of the corner tip to use. In a third mixing bowl, whisk together confectioners sugar, 3 Tablespoons milk and just a pinch of salt. Melt 4 Tablespoons butter in a small microwavable safe bowl for about 20 seconds. Pour the melted butter into the icing mix and whisk again. Pre-heat griddle to 375 degrees. Measure out 1/4 cup pancake batter and place onto griddle. Repeat this for as many pancakes will fit on your griddle. 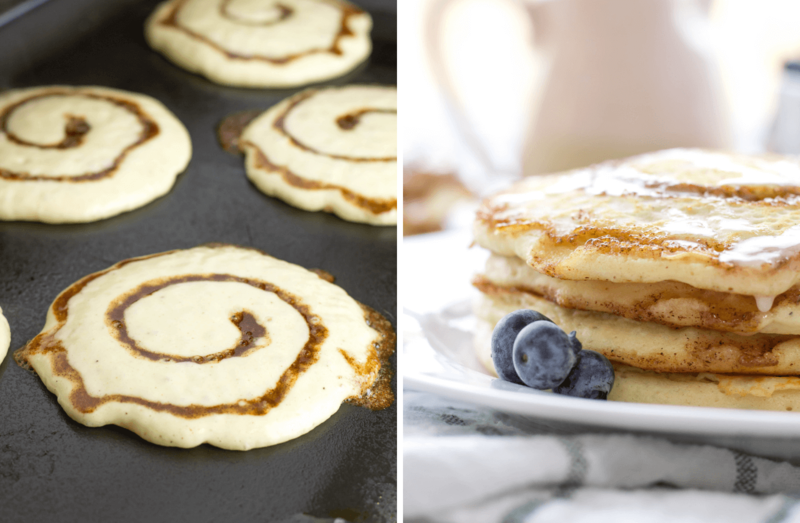 Use the cinnamon swirl mix from the cut sandwich to create a swirl on each pancake starting from the center. Cook for 2 minutes and flip. Cook another 1 minute, 30 seconds. Serve with a drizzle of icing. Cinnamon Apple Oatmeal Bake made with old fashioned oats, honey crisp apples and cinnamon baked in the oven for a great start to the morning this Fall. Honey crisp apples are one of my families favorite fruits during the Fall season. 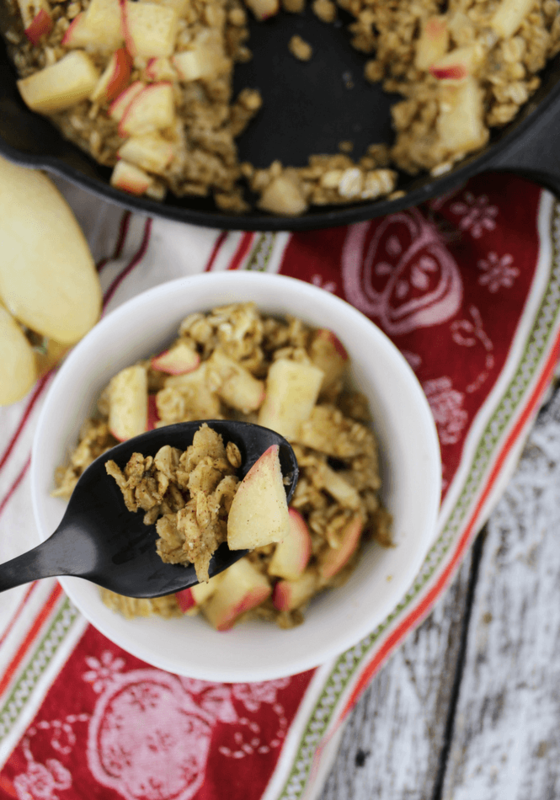 I loaded up this Cinnamon Apple Oatmeal Bake with these delicious apples and added some cinnamon for a really comforting and sweet breakfast. This is one of those meals you can feel good about feeding your family. It is filling, healthy and easy to toss together. Prep it when you wake up and let it bake in the oven while in the shower! Wash 3 cups worth of honey crisp apples (about 3 large apples). Cut your apples into bite size pieces. In a medium bowl, add oats, brown sugar, baking powder, salt, and cinnamon. Mix together. Set to the side. In a second bowl, add 2 eggs, almond milk and vanilla extract. Whisk ingredients together. Mix the dry ingredients with the wet ingredients and put half into a skillet or a casserole dish. Place half your apples on top. 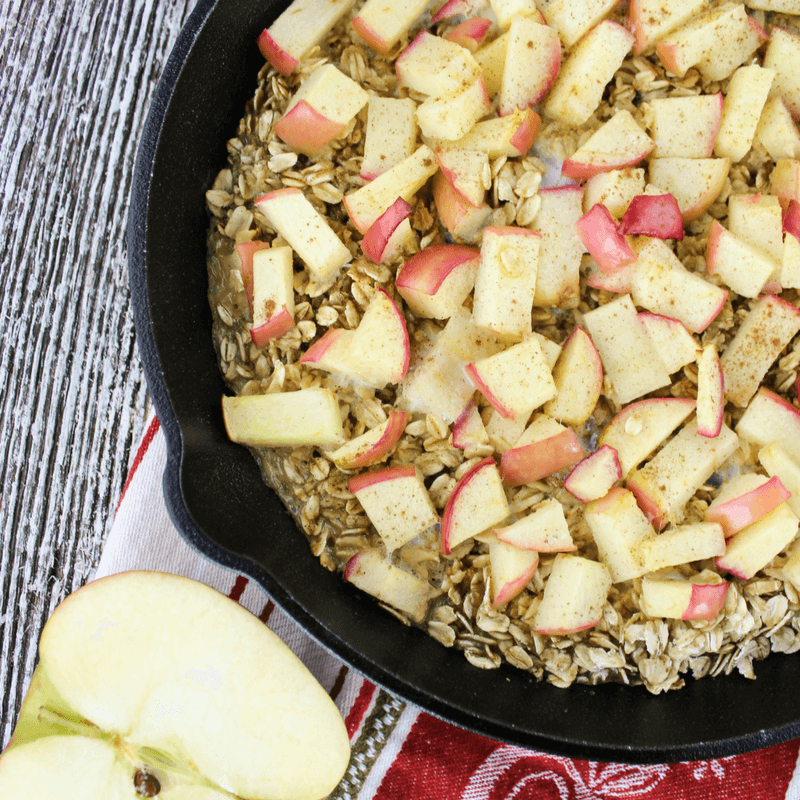 Pour the remainder of your oatmeal mixture into skillet. Place the other half of the apples on top. 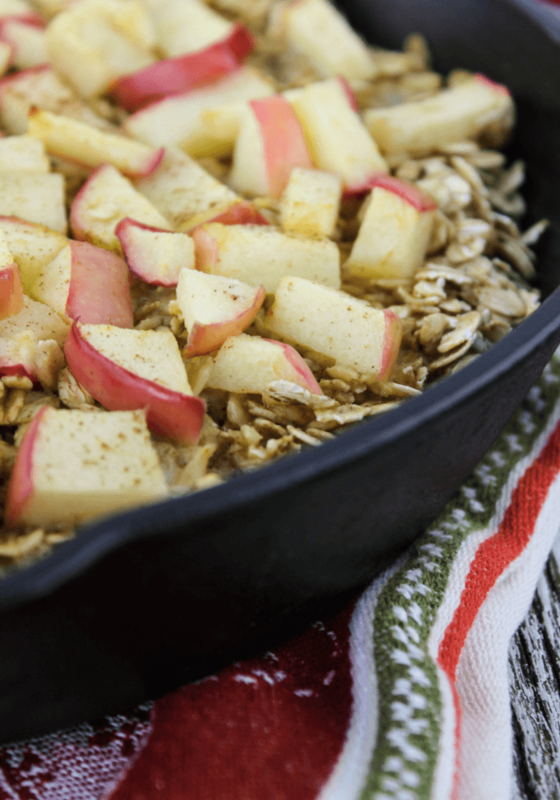 Love baked oatmeal recipes? Try the Triple Berry Baked Oatmeal a la Mode with ice cream for breakfast! 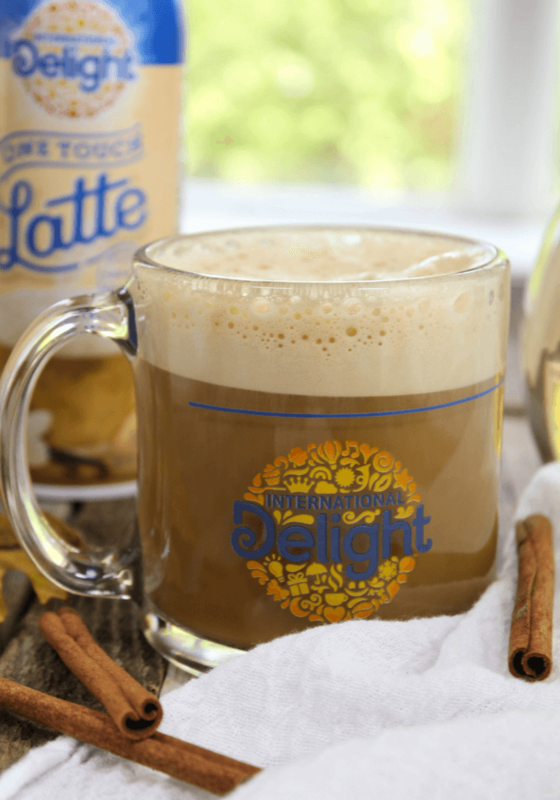 Cinnamon Caramel Latte made easily at home with a cinnamon simple syrup, freshly brewed coffee of choice and International Delight® One Touch Latte™ Caramel. 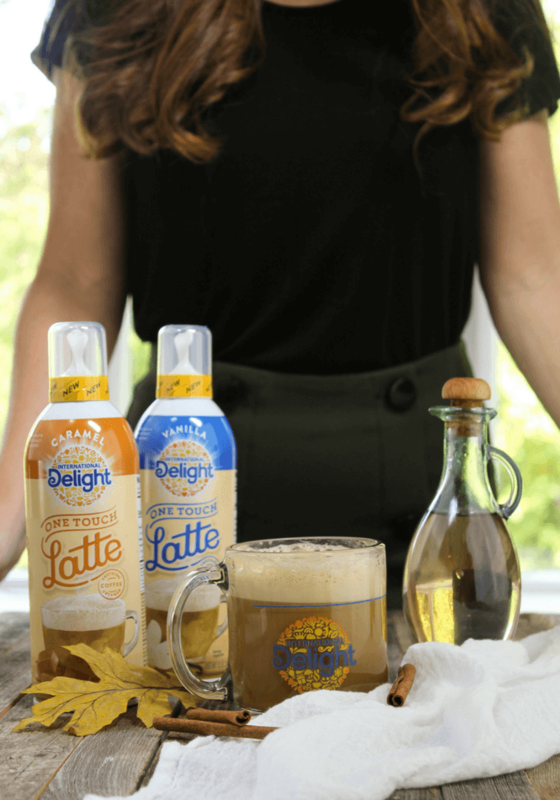 Bring in the Fall by turning that daily cup of coffee into a simple, delicious latte with froth to obsess over. This Fall has been an odd one for weather. It has felt like summer here in Cincinnati but that crisp, cool breeze has been making an appearance more and more. The big cozy sweaters, warm boots, stacks of firewood, and chunky throw blankets are out and ready for use. Comfort foods and drinks have been on my mind and this Cinnamon Caramel Latte hits the spot. I picked up everything I needed for this Cinnamon Caramel Latte at my local Walmart. 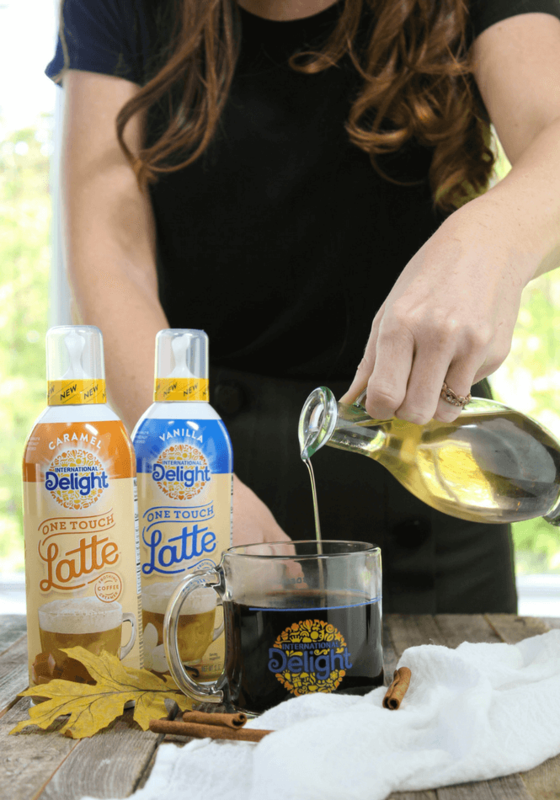 International Delight® One Touch Latte™ can be found in the refrigerated section next to milk and coffee creamer. One Touch Latte™ comes in crazy good flavors like Caramel, Vanilla and Mocha. Caramel is needed for today but I recommend trying all the fabulous flavors. You will be able to get seven uses from one can. Coffee, cinnamon sticks and sugar will also be needed to complete this recipe. Fill your mug 2/3 full with your favorite coffee. 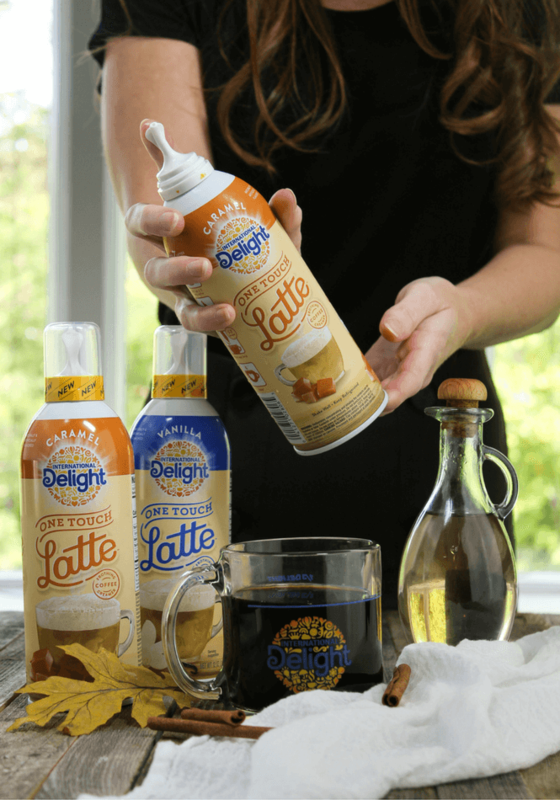 Press and hold the can above coffee to cream to desired sweetness and enjoy! Press hard for frothy latte. Press it, press it real good! Cinnamon Caramel Latte steps are shown separately later in post. Check out the video below to achieve that perfect froth! 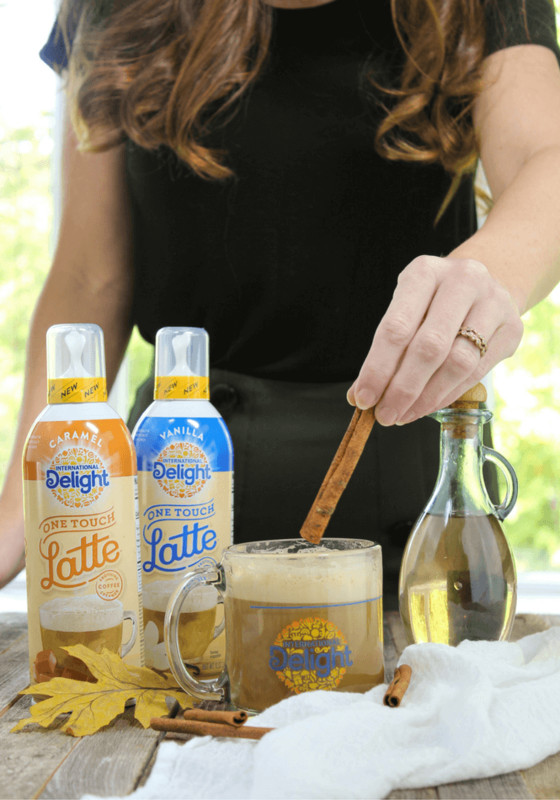 Now that you know how to create the perfect latte for this Fall season from the comfort of your home, let’s add some cinnamon to the mix! Try a Cinnamon Caramel Latte using One Touch Latte™ in Caramel and a cinnamon simple syrup. To get the cinnamon flavoring, I recommend using a cinnamon simple syrup for a smoother drink. With a couple basic ingredients, you can prepare your very own. Start with a cup of water, one cup of sugar and a cinnamon stick. Bring to a boil on the stovetop. Remove from heat and let cinnamon steep for one hour. Place cinnamon simple syrup in a sealable container to be used as needed. Add 1 tablespoon cinnamon simple syrup. Press and hold the can above coffee to cream to desired sweetness. 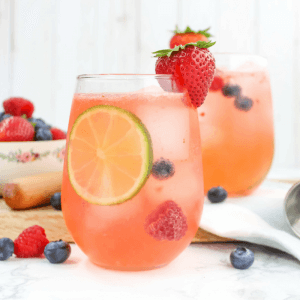 Add a cinnamon stick for garnish if you would like and enjoy! Having guests this holiday season? Create an inviting coffee bar area featuring International Delight® One Touch Latte™ in Caramel, Vanilla and Mocha. Set out the cinnamon simple syrup and a fresh pot of coffee. A roaring fire in the fireplace would be the cherry on top to enjoy company this Fall with a warm latte in hand. 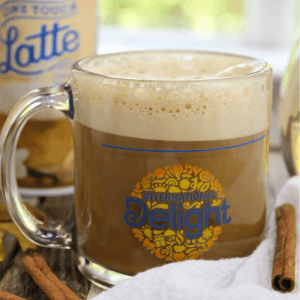 Cinnamon Caramel Latte made easily at home with a homemade cinnamon simple syrup, freshly brewed coffee of choice and International Delight® One Touch Latte’™ Caramel. Make the simple syrup by adding 1 cup water, 1 cup sugar and 1 cinnamon stick to a pot on a medium heat. Bring to a boil and let steep for 1 hour. Remove cinnamon stick. Place in a sealable container and use when needed. Fill mug 2/3 full. Leave room for froth. 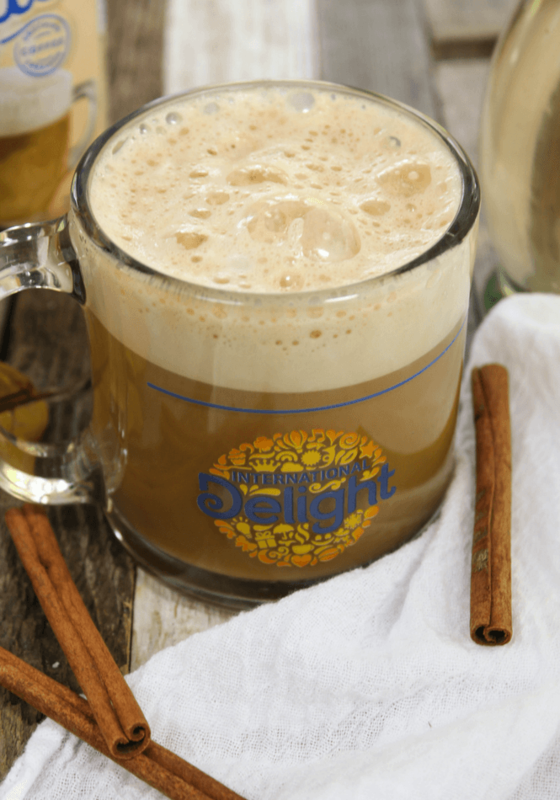 Shake International Delight® One Touch Latte'™ Caramel. Press into coffee for 5 seconds. 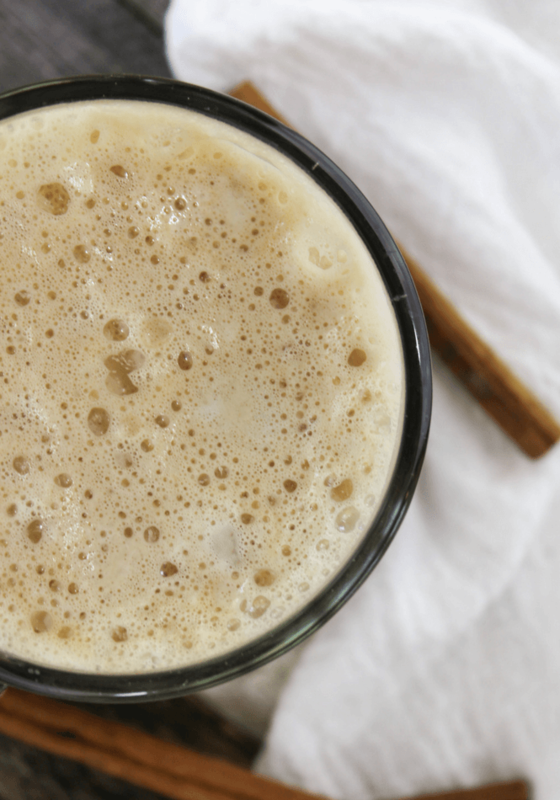 Turn everyday coffee into a sweet, frothy latte!